It was eight degrees when we arrived at Elephant Hill. The visitor center was closed and it appeared that we were the only ones dumb enough to visit Canyonlands National Park in December. I wondered why we bothered to pay for the permits when a ranger pulled up. I would have hidden our paddles had I known the authorities were lurking about but he spotted them and asked about our plans. He told us that a group of packrafters has been rescued a couple weeks earlier. 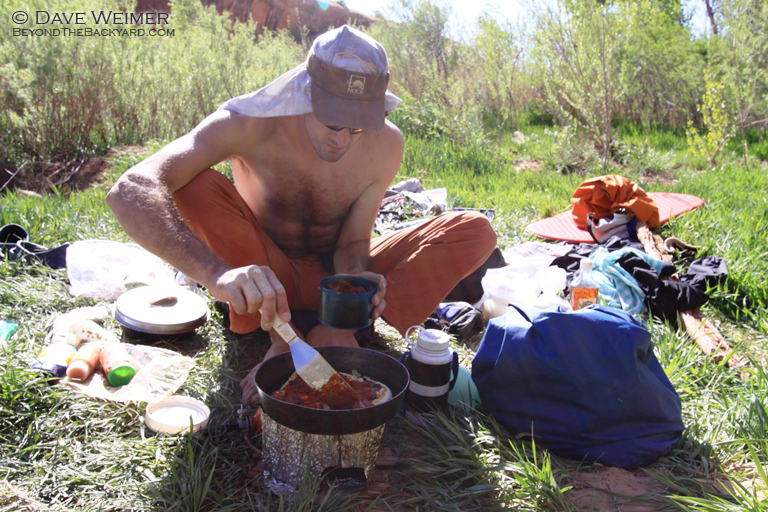 They’d hiked down Rustler Canyon, floated the Colorado River for a while, and then couldn’t find their way out of the steep cliffs that surrounded them. Fortunately, a family member back home had raised the alarm. A helicopter spotted the group and flew them to safety. They went without food for a couple days; at least that’s the story. It was a sobering reminder of the fact that we weren’t exactly sure how we were getting out of the canyon ourselves. We heard a few people had climbed out just above Calf Canyon. That information alone seemed good enough for us. 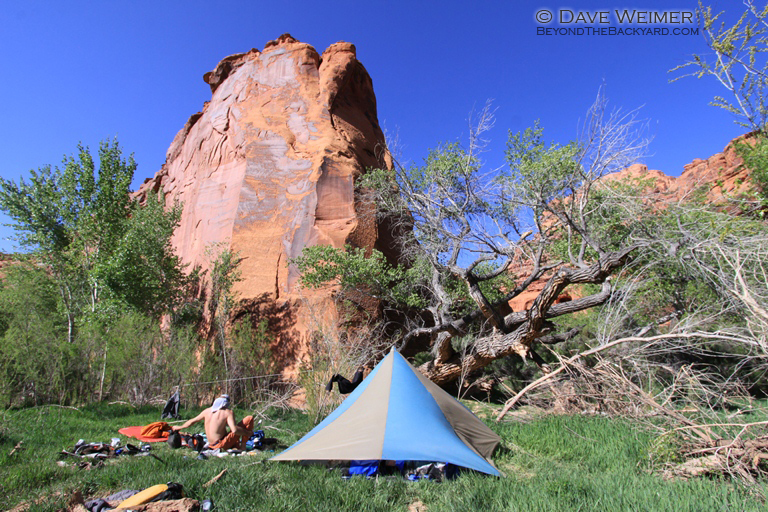 We approached the river via Red Lake Canyon, camping at Spanish Bottom. 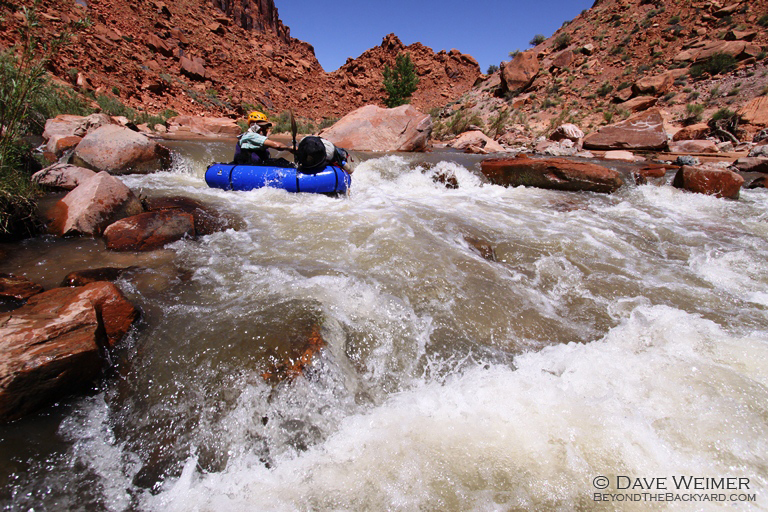 The following day we ran all the rapids above Cross Canyon. Paul flipped once. It was about 35-40 degrees down there mid-day and even though he had a drysuit he got pretty cold. He was able to dry his things over an open fire that night. The 3rd day started off well until I flipped my packraft right in front a giant recirculating hole. Not good. I was able to flip the raft back upright, but then I glimpsed the maneater directly in front of me. Without hesitation I ditched the raft, swimming like hell away from it. That’s when I slammed my thigh hard into a submerged boulder. Luckily Paul didn’t flip and managed to push my packraft to an eddy. Meanwhile, I was able to catch my paddle and swim to shore. I was exhausted and the swelling in my leg was already causing a limp. I sat on a boulder and tried to regain my strength. Across the river I could see the famous inscription that had been pecked into the rock by prospectors in 1891. It read: “Camp #7, Hell To Pay, No. 1 Sunk & Down.” It appeared that other folks had had some troubles there, too. After that we were both a little gun shy, neither of us wanting to risk another swim in those temperatures. 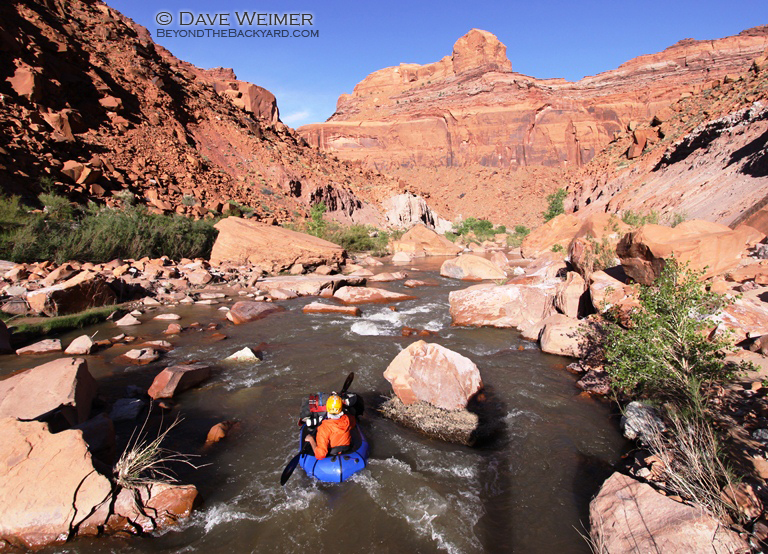 We ran some of the rapids but we portaged the three Big Drops including Satan’s Gut, all of which were very bony at 4000 CFS. While portaging we hiked with the paddle over our shoulder, the packraft dangling from the paddle behind us. We found it a quick and effective means of carrying an inflated raft when there’s no brush or wind to contend with. We began calling it the ‘Huckleberry Finn Method’. 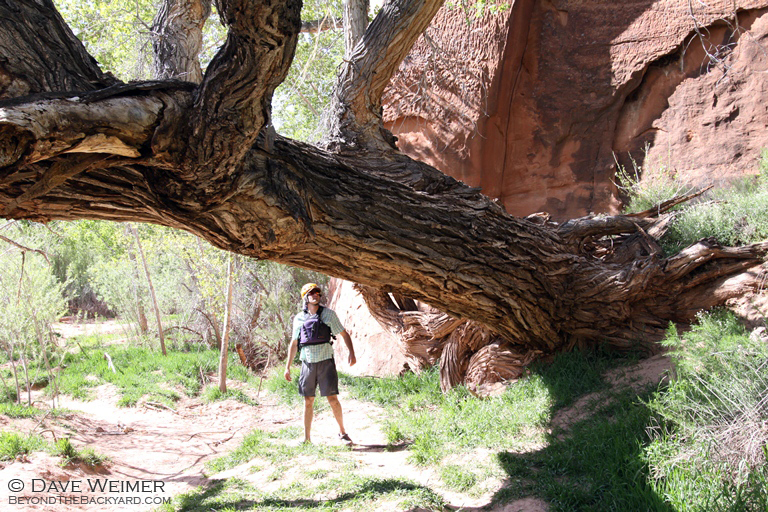 We found the exit out of the canyon, just upstream of Calf Canyon like we’d heard. It was a third class scramble on loose boulders and crumbly rock- kinda scary actually. But it went! The rest of the hike was easy, the entire way on good jeep trails. We found a nice camp at Bobby’s Hole. Overall, a fantastic adventure. Would I do it again in December? Probably not, it was a bit too cold for this Florida boy, but we had amazing scenery, great hiking, and fabulous whitewater. That, and we had the entire National Park to ourselves. What else could a packrafter wish for? 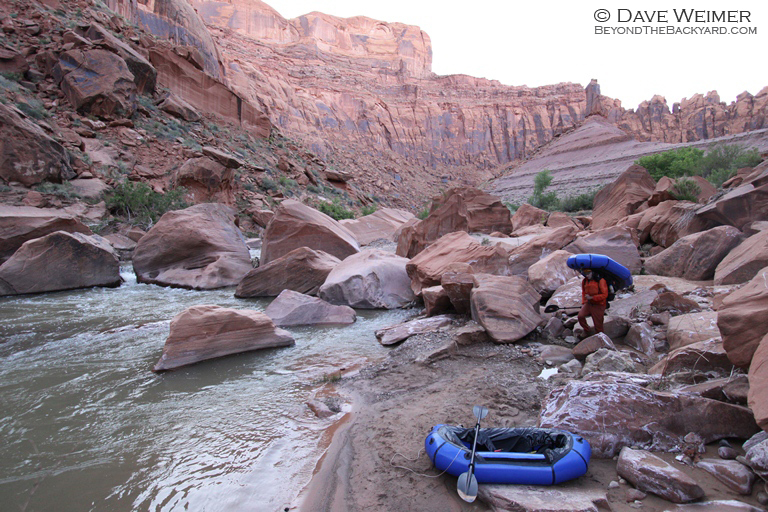 Every May I make the annual pilgrimage to the desert, this time, I brought my packraft. 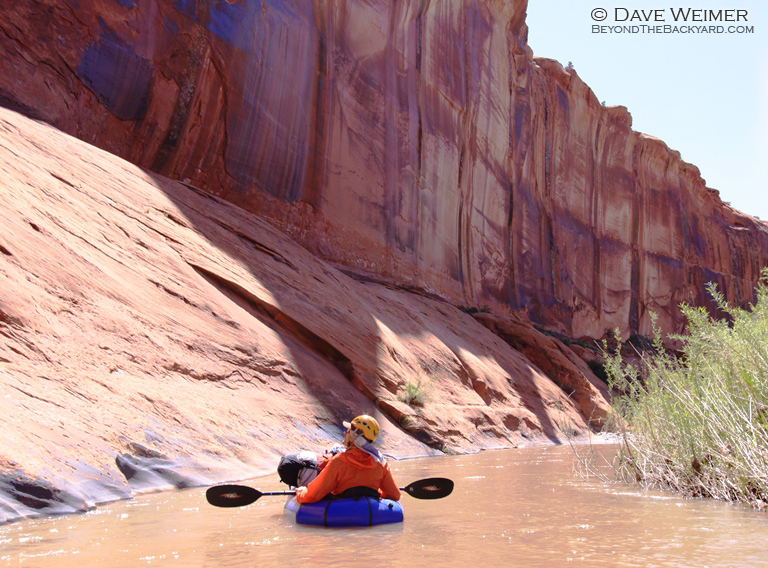 Brian and I intended on catching the spring runoff on the Escalante River. 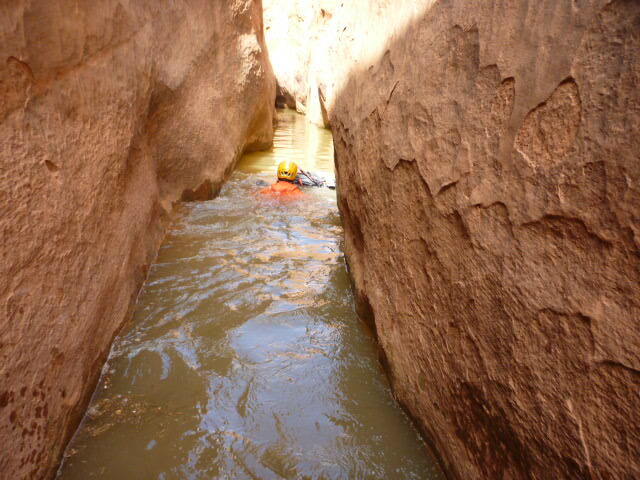 I seriously doubted there would be enough water, so we brought a rope in case canyoneering became our only option. We paid a guy to do our shuttle but next time I’d just hitchhike, there are a lot of day hikers in the area. We started at the Egypt trailhead and made our way down to the river. 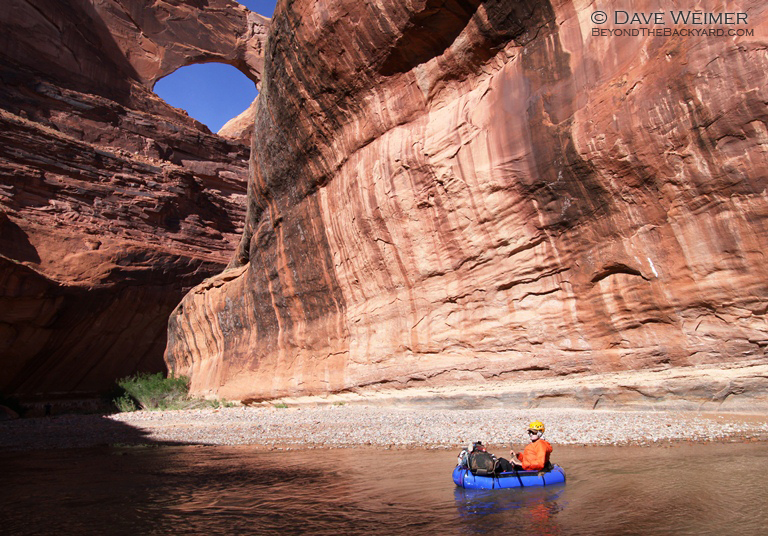 Delighted to find plenty of water for our float trip, we inflated our packrafts and paddled our way to the mouth of Neon Canyon. We woke early the next morning and hiked to the top of Neon and repelled in. There were several parties of day-trippers doing the same thing we were. I feared the inevitable traffic jam. I had a dry-top and Brian had a wetsuit. The swims were long and much colder than I thought they’d be. To keep warm, we ran through the dry sections to the next obstacle. We knew of two ‘keeper potholes’. The first one was extremely deep and intimidating. One person would not be able to get in and out himself. We jumped in and Brian stood on my shoulders. The water was deep and my mouth was barely above the surface. (A packraft could have been useful here.) He got to the top and threw me the rope. The second keeper hole was full of water and we cannon-balled in and just swam across it. There were three rappels. 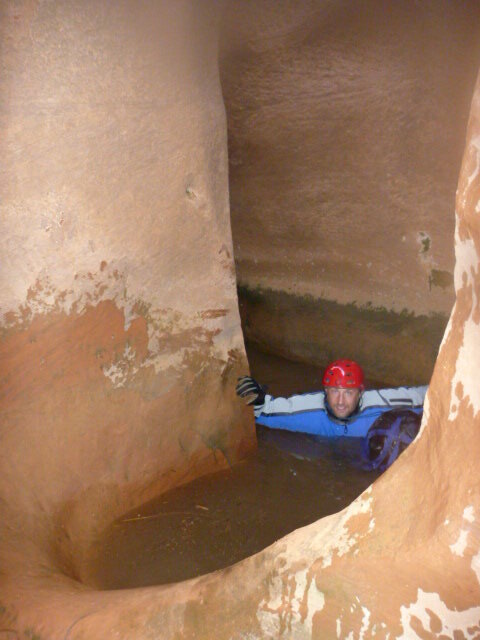 The last of which is a free, 80’ rap through Cathedral Arch into a pool below- awesome! 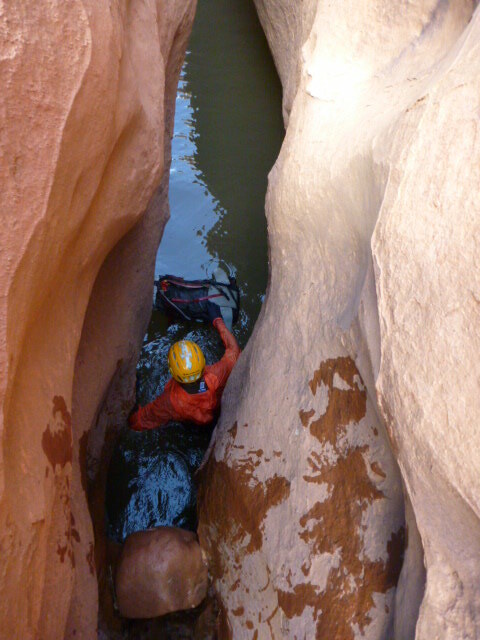 We were glad we bypassed the other canyoneers because one of them got stuck mid rappel and sat there dangling for quite a while. Above: Cathedral Arch. Site of the last reppel. 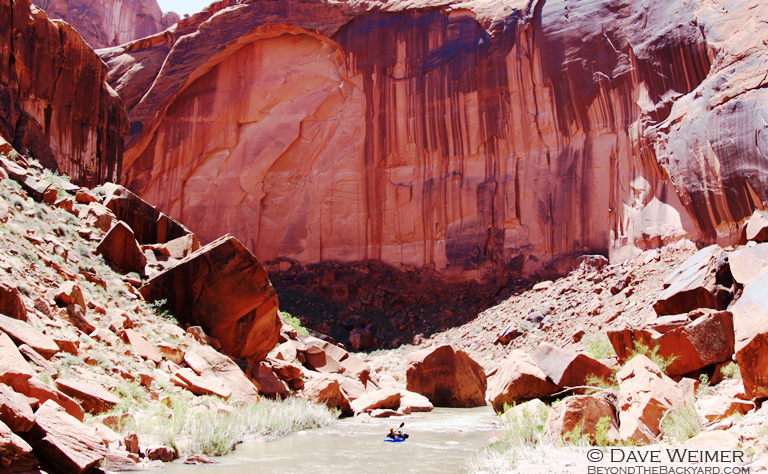 Running the Escalante River is fantastic. It’s like a mini Grand Canyon. 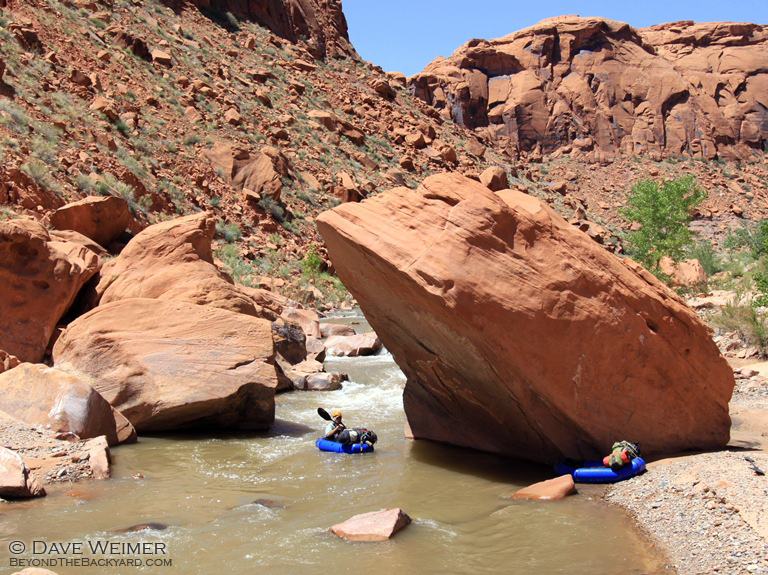 The river is chock full of sandstone boulders. It becomes a game to see who can make it through the maze. 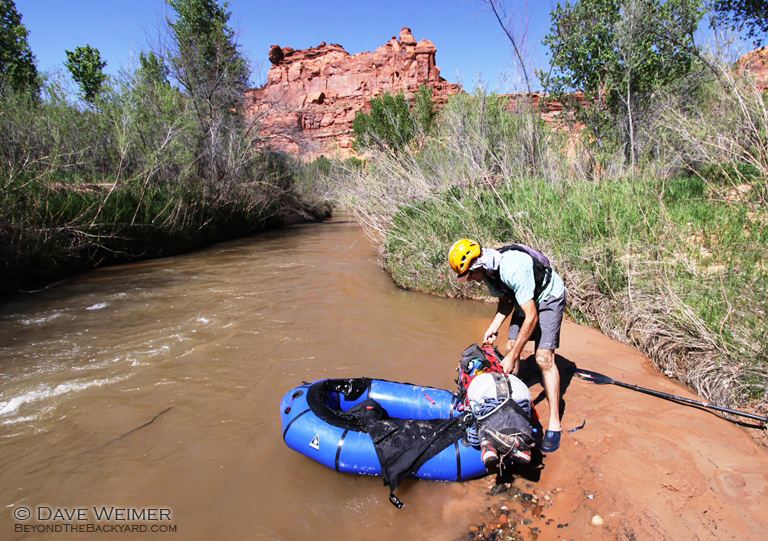 I wouldn’t want any other boat besides a packraft to do the Escalante. 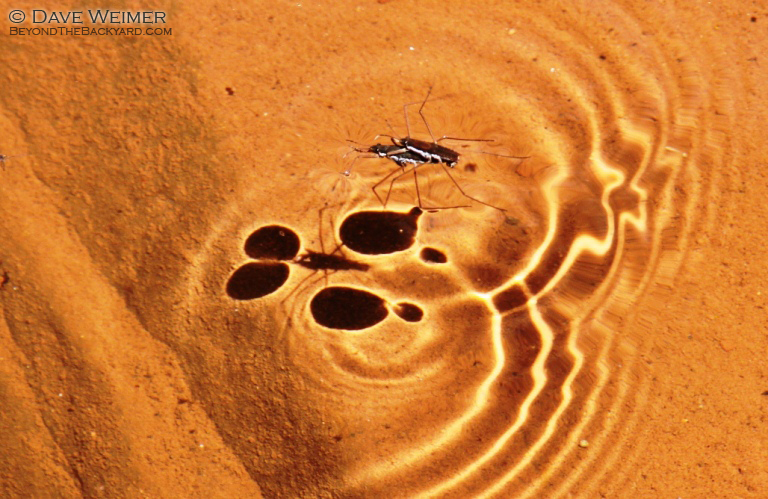 Above: A mating pair of Water Striders. I heard of people trying it with a canoe. That might be possible at extreme high water but I can tell you, it wouldn’t be fun. There were two major portages but we were in and out of our rafts several times. Note: There is a TON of poison ivy in the Escalante drainage. A few years back I got it all over myself when I went hiking without a shirt. Never again. It was on my nuts. It is REMOTE back there. Bring good maps and common sense. We met one other packrafter. After Neon Canyon we saw no one else for 4 days. 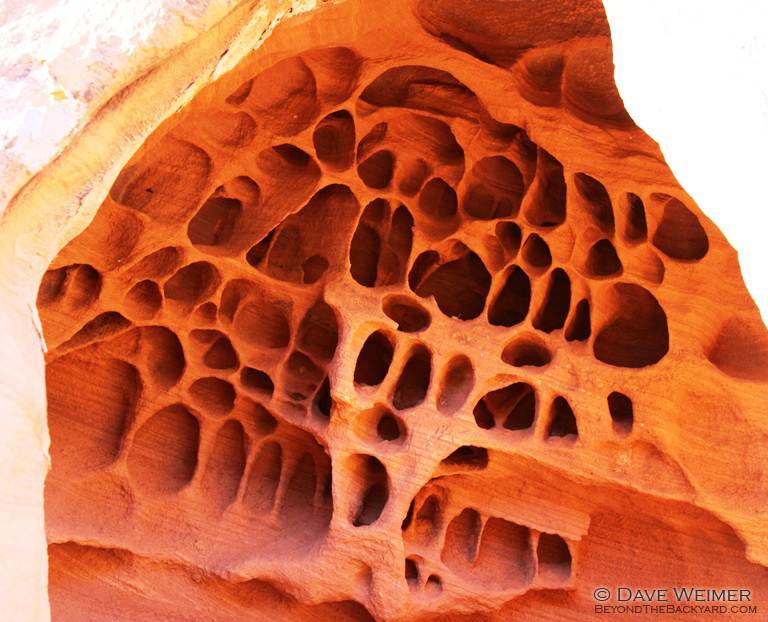 We hiked out at Coyote Gulch and Crack-In-The-Wall. You’ll need a rope to haul your pack up- it won’t fit through the slot. I’ve wanted to visit Katmai forever and this year I was finally able to make it happen. 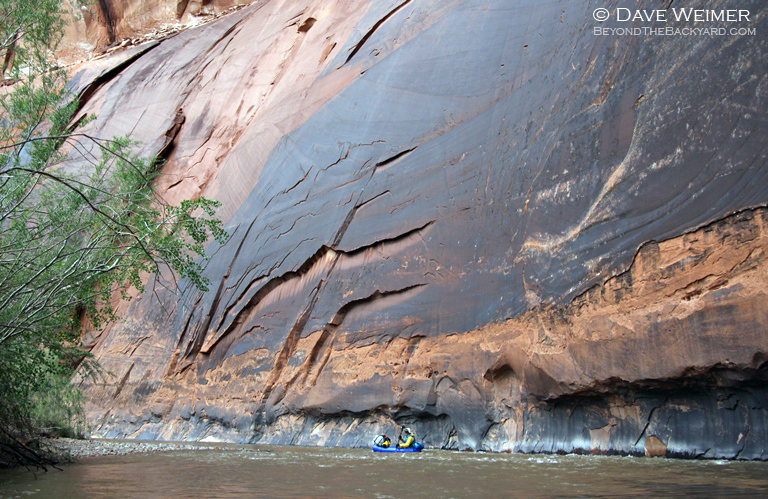 I also wanted to do some packrafting while I was there and after a bunch of research- American Creek made the cut. Orlan, Mike, and I flew into Hammersly Lake with Cecile (C-Air out of King Salmon) as our bush pilot. It should be noted that it is possible to fly from Anchorage directly to Kulik Lodge with Katmai Air. Seats are reserved for guests of the lodge but occasionally they have a couple openings. 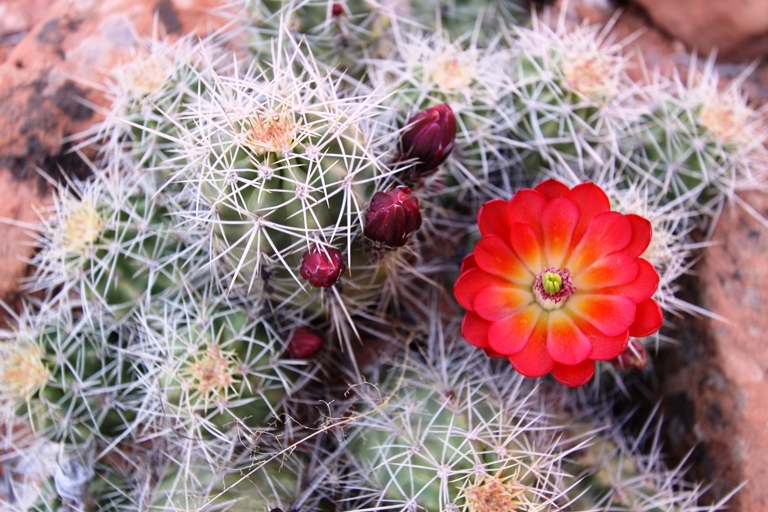 It would be worth your time to check on availability. 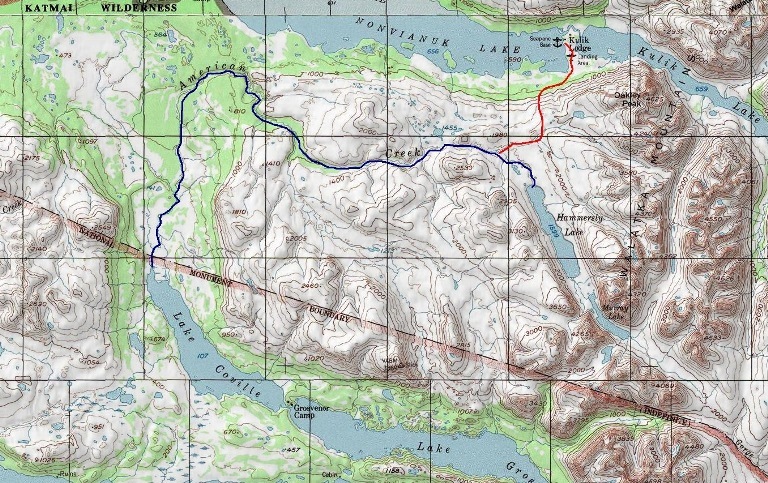 Once at Kulik, you could then hike the 8 miles to American Creek. Most of the hiking is above treeline and looks pretty good. You may even be able to float the small tributary there but be careful, there is a waterfall in the vicinity. We began our float in early July, before the salmon run, so we didn’t have to contend with a multitude of bears. In fact, we only saw two. We took another packrafters advice though and brought a bear-fence anyway. The alders were thick near camp spots on the lower river and the fence made sleeping a heck of a lot easier. 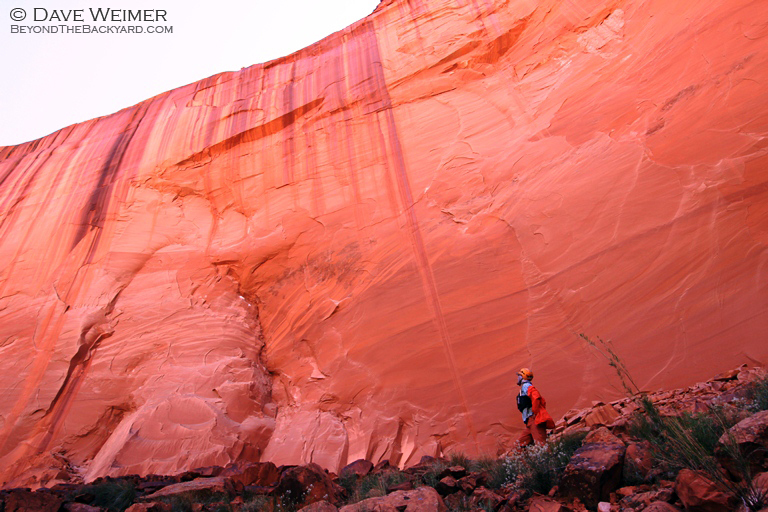 When entering the 1st canyon, you will notice a football-sized blotch of red lichen on the face of a small cliff, river-right. This is the indication you are within a quarter mile of the tricky, class III+ rapid. It needs to be scouted. 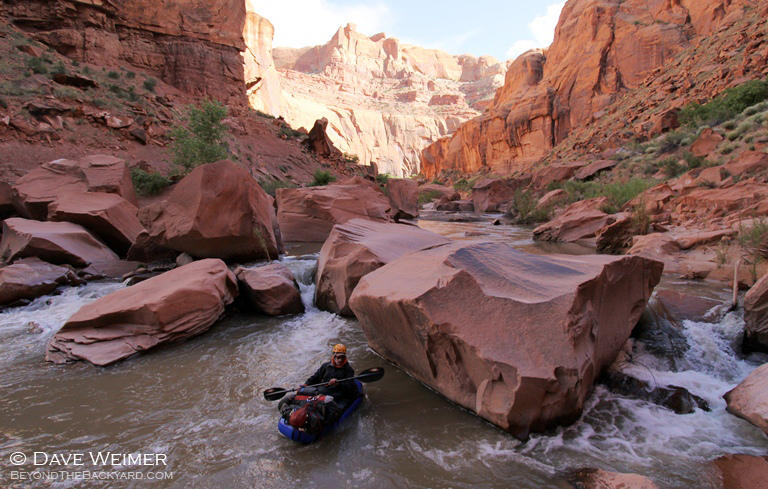 A steep but easy portage can be found on river-right. 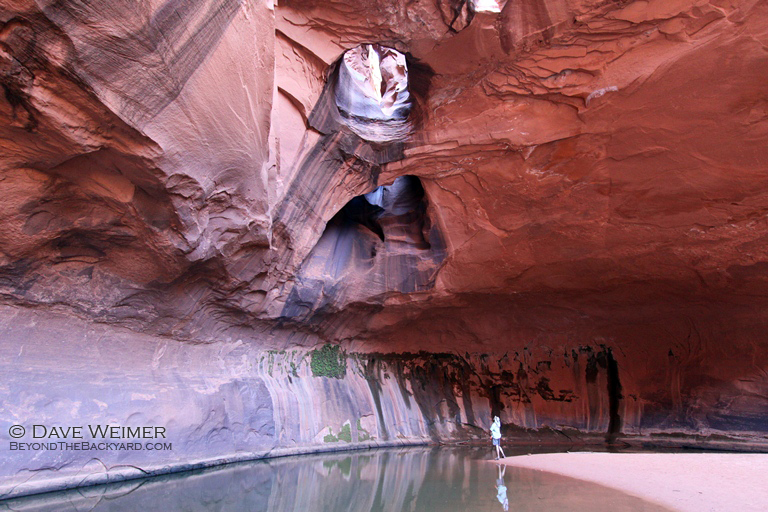 The spectacular lower canyon is a great place to fish. Every cast reveals a pink polka-dotted Char. We opted to catch and release so the next folks will have the same fun we had. The high water this year produced a series of logjams that appear around blind corners. When the river begins to braid be very careful. The volume of water being forced through these strainers would pin you. We had to portage 4 times. Check out the video of our trip here! 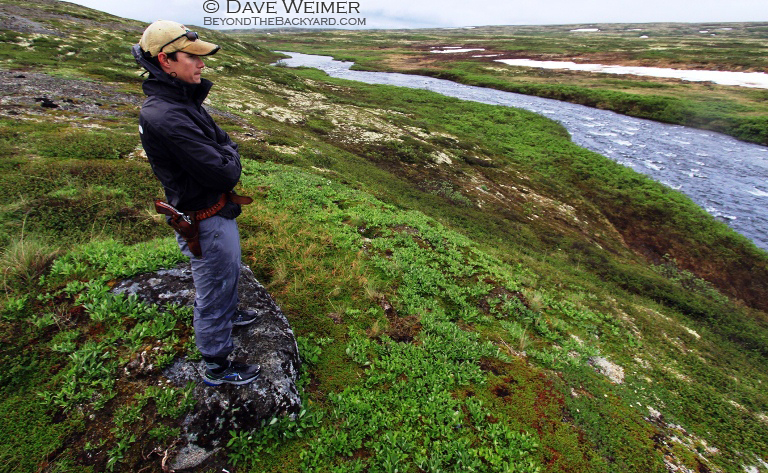 After encountering the major tributary flowing from the west, be sure to find a camp within 1 mile. After that, there is nothing but swamp until the take-out. 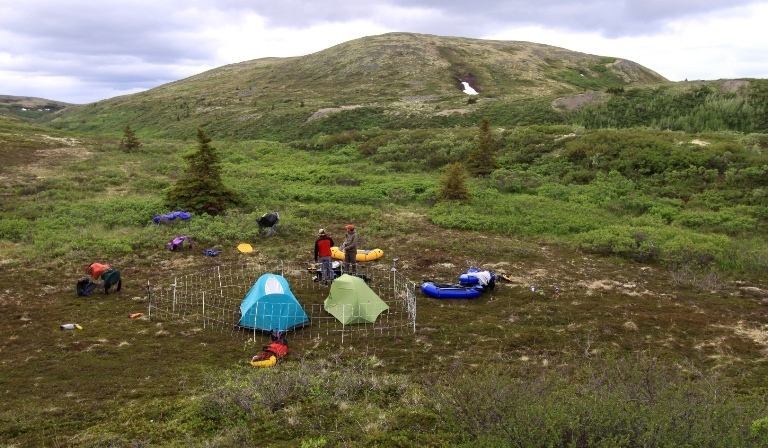 At the pick-up spot, be sure to plan a night on top of the obvious hill, it’s a special place. Plan on bringing a headlamp. I didn’t and wished I had one. In Katmai you are at a low enough latitude to have some pretty dark nights. I recommend Cecile (C-Air) highly. He’s a one-man operation with a Cessna 185. He flew the three of us with all our packraft gear into Hammersly Lake and out of Coville Lake for $950- if you shop around you will find that this is one hell of a deal. 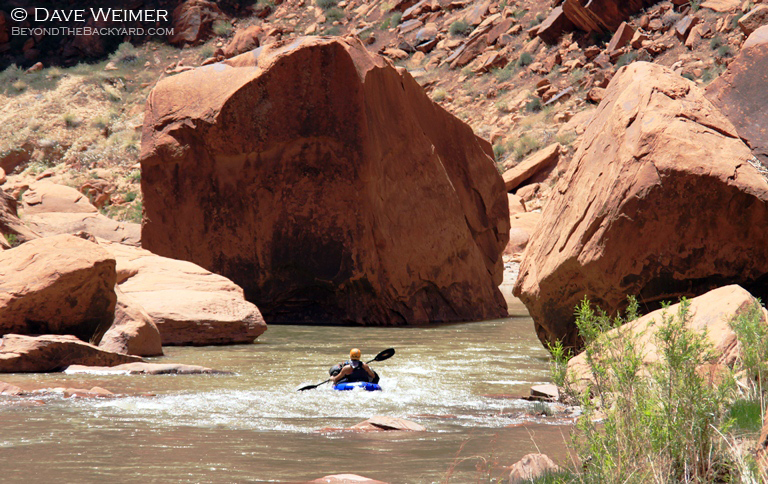 Brad Meiklejohn has some great advice for those who want to float American Creek. Read it HERE.